This CD was initially available only at their summer 2004 live shows. Included are brand new studio recorded acoustic versions of their entire tour set. It is not a pressed CD, but rather a CDR printed to demand. It is packaged in a slimline case like a CD single. It's an amazing preview of what the new album will be like, including acoustic versions of several new songs which are destined for the new CD. Get it if you can! This CD-R was available at C&J's Summer 2004 concert gigs and for a short time on Electric Paintbox online. It is no longer available, although several of these tracks were re-worked and re-recorded for the ARK-eology album and can be heard in their final form on that CD. 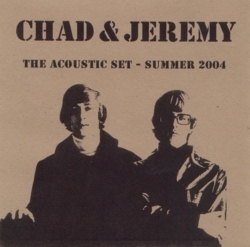 The same may well be the case with some of this sampler's newly-written material when Chad & Jeremy release their CD of all-new material in the future. Each annual tour CD-R - designed to be distributed in extremely limited quantities so that you could get a sneak peek, hopefully without ruining your appetite - represented the work-in-progress pencil sketches and demos to the final oil paintings that are the recordings you hear on ARK-eology, and in some cases potentially on the next CD.